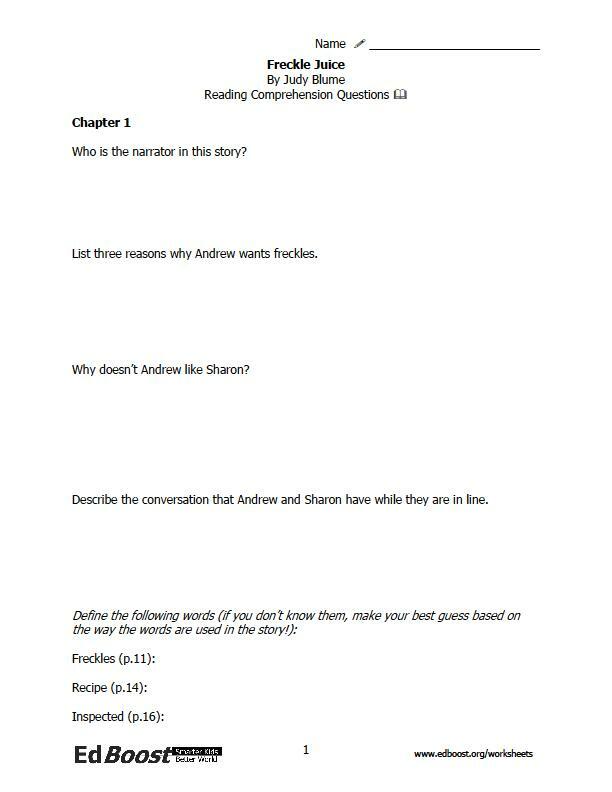 Reading comprehension packet and answer key for: Freckle Juice by Judy Blume Summary: Freckle Juice is the classic story of a kid who wants freckles so badly, he buys, concocts, and tries a freckle juice recipe that he buys from a classmate. This story, which has been entertaining beginning readers for years, is a great story about trying to change your appearance and learning to accept yourself. Reading level: 3rd grade. Themes: being a little boy, freckles, appearance, getting ripped off. Audience: This book is good for early readers who are just getting into chapter books. The type is big and there are a lot of pictures and the story is very short, so it could be fun for students younger than 3rd grade. This book is a great intro to Judy Blume, whose other stories, while longer, are just as entertaining as ever.